(UPDATED READ BELOW)This is a 7 terminal lcars and it has been a long time in the making. there is a button for almost every thing I could think of and also hidden menus in the programs terminal which you will find when you go to games or internet terminal. also there is a lot of added sounds and voice file and just keep in mind if it looks like a button it is. for example go to the yellow alert and it turns red just click on it and get a sound. I have tried to mix old trek and new trek style lcars to give I hope close to real lcars except it doesn't really talk back but im working on that with speech recog. also there is a set of instructions that is important so please read them also there is a required font that you have to download and then download lcars refit. thats if you don't already have this font many people do. also please comment on this lcars. ran across this by accident, looks really good, congrats. I have to say... being a trekkie myself.. this is pretty cool..and I have some old Star Trek walls I can add to this I think!! Thanks.. I could never do this! to daehawk thanks for the comment sorry it took me so long to get back to you and as far as resizing lcars refit you can do it just it will take alot of time in the paint shop resizing everything. i am very sorry i dont understand what you mean by psd files please fill me in on that i am bad with abbreviations of things. also you can email me if you want to ask me more questions you can easily send messages privately here on wincustomize also be careful on two things. Great man I cant wait. And KUDOS on the old school programs. What is the name of it I prob have it.... I collect older programs and use alot of them. But I wont bother you much looking foward to the new release. I downloaded the update hoping it would handle 1920x1080, but it's still at 1024x768. Why such a low resolution.? Even my tablet handles full HD. am I missing something? hello gevansmd i am not sure what your getting at the update is for the added animation i put in and the remastered old animations with updates to them. this lcars was made for resolution 1024x768 only but it can be resized by you in paint shop but it will take alot of time and hours to resize the entire program. 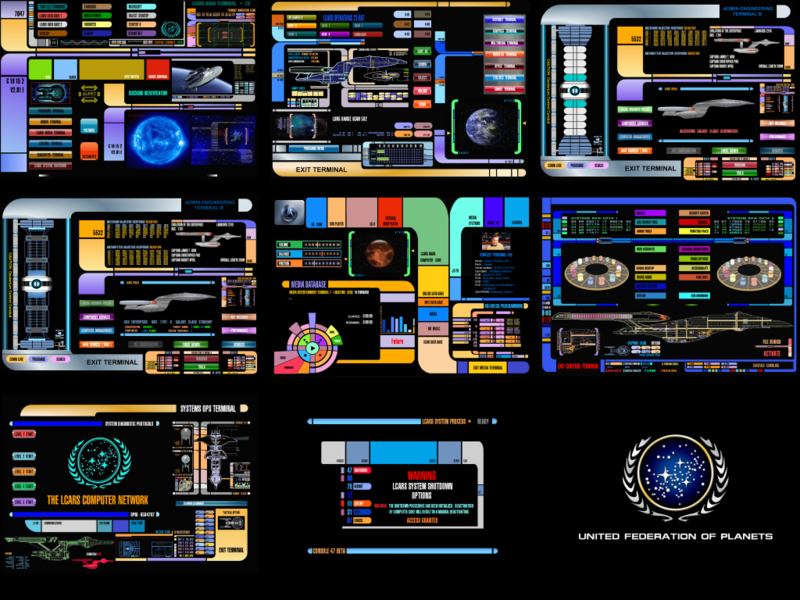 1024x768 is the highest LCARS REFIT will go as i made it this way for those who have this resolution which is alot of people including myself. i have tried alot of lcars programs in the past but they where to big in resolution and just about every comp i have had has been 1024x768. so i built LCARS REFIT in that resolution as i saw others as well that where screaming for a 1024x768 lcars. i hope you understand and very sorry if there are problems on your end. For the record, MOST people run at least 1600x900 these days. Mostly just old systems run at 1024x768. I do, however, understand one skinning for one's own used resolution. It does make this unuseable for me as well. I run at 1920x1080. A very common res these days. My apologies, I was looking at some of your screenshots and remembering some of the frames I'd worked on in the past. I had attempted some DesktopX theme objects based on the System47 LCARS screensaver but had scrapped most of those as I developed the project. I went in a different direction due to much criticism over the gradient look. A review of my old project leads me to repent of my insinuation. Your project looks good. thanks alot i am glad you like it and if you have any problems let me know i will try my best to help.